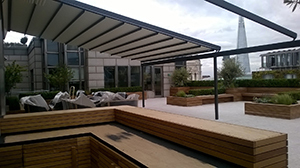 Samson Awnings have just completed the roof top installation of a Weinor Pergotex system on the 7th floor of an office block in central London. Due to the high and exposed location the Pergotex was chosen as it has a tested capability to deal with winds up to Beaufort scale 8 and with the PVC cover coupled with lateral support bars the system has a high level of fabric tension enabling it to withstand heavy rainfall too. 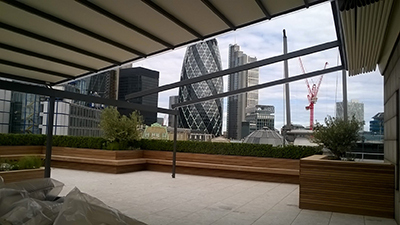 The location is stunning and the area has been designed for corporate hospitality for the clients offices. This attractive addition to the London skyline can be viewed from every major central London building. The Weinor Pergotex is one of the products Samson Awnings regularly install for all year round weather protection but with the added advantage of being able to fully retract the fabric roof system when the weather dictates. The fabric roof is fully automatic with various control systems for operation and safety systems in case of extra high wind conditions. The tough PVC fabric roof is further strengthened with aluminium support struts along the width and in this installation 2 units were coupled together for a large cover of approximately 70 square metres!! The front and sides can be filled with various optional systems such as vertical blinds, sliding glass doors and so on to truly create an outdoor room area for many people to use all year round. The aluminium framework is prefinished in a choice of colours and the rainwater is directed into a front guttering profile where the water is dispersed down one or some of the support legs and out to clear the covered area. With the fabric roof fully retracted the Pergotex still looks smart on any building, gone are the days of multiple support tubes across the width making the framework overpowering and unattractive when not in use.